Keep the date of a special occasion forever close to you or someone you care for with an elegant personalized bracelet from Sorella Jewelry Studio. Classic Roman numerals give your special day the honor and permanence it deserves. Whether you choose palladium, gold, or sterling silver, your bracelet will be as treasured as the occasion it recalls. 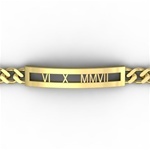 Roman Numeral Bracelets are the perfect choice for birthdays, bridal showers, graduations and anniversaries, too. There is nothing else like the Sorella Roman Numeral Bracelet you order - because you design it yourself. Simply tell us if you prefer 10k or 14k gold (yellow, white or rose), palladium or sterling silver - or combine them for a gorgeous two-tone effect. We'll put the details together for a special piece that could only come from you.